Pay only $1599 as our stocktake special offer.. The Janome 1200d cover hem overlocker is just the easiest overlocker to thread ever. . It is the only machine that does overlocking with up to 5 threads. it also does a chain stitch but to cap it off it does 3 needle cover hems as well. ring us to find out more on 1300137041. Save $400 off RRP. As an overlock machine, the Janome 1200D can sew thirteen different overlock stitches including the five-thread safety stitch which combines a chain stitch with overlock stitching and a blanket stitch for professionally finishing a single layer of fabric such as polar fleece. As a cover stitch machine, not only can the 1200D handle two and three thread cover stitches, it can also sew top cover stitching popular on stretch knit fashions and a chain stitch for a total of six cover hem stitches. 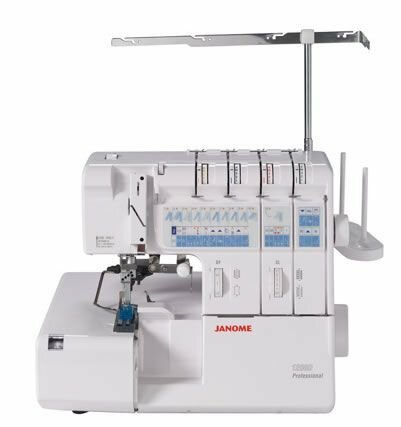 The Janome 1200 D includes easy-to-use features such a program display panel for easy switching between stitches, color coded threading chart and thread guides for easy threading, and automatic tension adjustment for effortless professional results. Simply select the stitch you require for the task and the professional 1200d thread tension system will automatically adjust the correct tension for you. This provides you comfort and confidence in knowing that you can obtain perfect results fats and with incredible ease. The upper looper system will automatically deactivate when top cover hem sewing is selected. Receivea 50 year bonus gift from Janome valued at $40 when you purchase the Janome 1200d sewing machine.